Since drummer Mark Greening and guitarist Tim Bagshaw defected from their previous employer and hooked up with bassist/vocalist Adam Richardson many moons ago they have slowly developed their claustrophobic take on doom into a towering, monolithic and hypnotic behemoth that draws from death metal as much as it does Floydian psychedelia. On this 6 track offering featuring 3 studio and 3 live tracks recorded in Denmark in 2007, Ramesses allow themselves to indulge the more “out there” Aspects of the band’s sound and serves as an intriguing and possibly essential entry into their rapidly expanding catalogue. The opening title track is a lysergic piece of experimentalism that runs to over 9 minutes as it builds from a soft, Middle Eastern melody into a spiralling riff that evokes the spirit of the band’s namesake. Not so much a song as an instrumental journey through the Valley of the Kings. Kicking off with this track immediately throws the preconceptions out of the window and shows that there is more to Ramesses than down tuned sickness. Fortunately the Ram’ faithful are well served with the next track “Blazoned Fauna” which kicks off with a riff crustier than a syphilis sufferer’s underwear!!! Adam Richardson runs the full gamut of his vocal stylings here as he flows effortlessly from an acidic Ozzyesque wail to the blackened screeches he is possibly more known for. The oppressive production, while certainly not high tech by most modern standards, is steeped in reverb and sounds as though it was recorded during some sort of ritual mass in the Great Pyramid. This is about as dark and truly terrifying as doom has ever got. The ritual gets even more bizarre on the third and final studio track, “Men of Horror”. Here Ramesses unleash a torrent of grinding chords played at a drunken snail’s pace underlying a recording of arch black magician and all round pervert nut job Aleister Crowley performing one of his magical rites. Most bands sing about this kind of stuff, Ramesses put their money where their mouths are and go back to the source of the inspiration. The hypnotic nature of the track evokes the vibe of a Satanic mass with eerie intensity. The three live tracks are going to be more familiar to existing fans of the band comprising “The Tomb”, “Before The Jackals” and “Black Domina”. This showcases the Ramesses we have all come to love and adore in all their blackened doom filled glory. The sound quality is not the pristine multi tracked affair you may be expecting and sounds more like a good quality soundboard tape yet somehow that serves to accentuate the dark nature of the band’s sound and display’s the sheer crushing heaviness and mass of sound that these three guys can produce onstage. 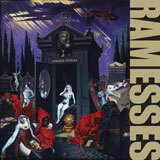 For a newcomer to Ramesses it may be more beneficial to check out the band’s last album “Take the Curse” before plunging into this world of darkness but for fans of the band, this should be an essential purchase, one that would be best served with the lights off, a few black candles and some intoxicating incense.